No HOA! Toy & horse lovers! 0.83 acre horse property! This beautiful 4 bedroom, 2 bathroom Sante Fe Territorial style home features a gated front courtyard, tile flooring and plantation shutters throughout, vaulted living room ceilings and wood burning fireplace. In this ranch-style split floor plan, you'll be treated to an eat-in kitchen with breakfast bar, and a family room with custom dry bar and electric fireplace and formal dining room. Master bed/bath has two private exits, double sinks, and custom walk-in closet. Incredible kitchen with updated stainless appliances, granite counters, and walk-in pantry. 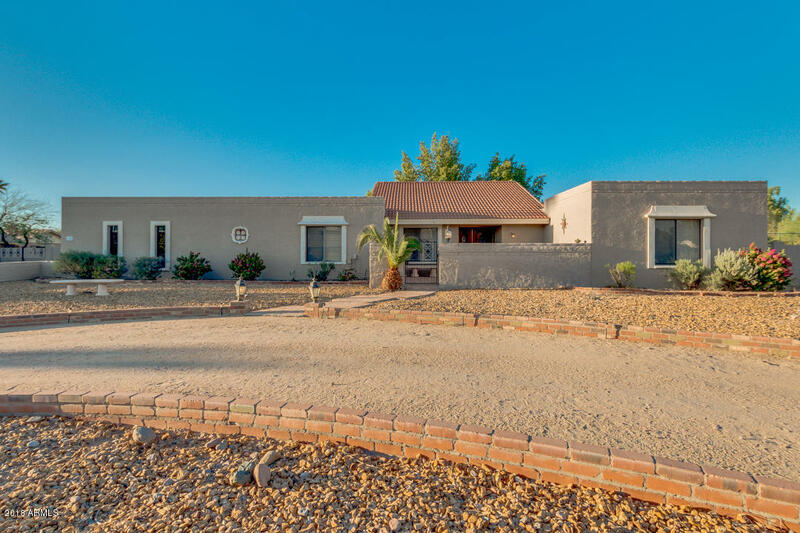 Through the kitchen, an Arizona room with extra storage, and beyond a screened patio w/built-in BBQ. 1600 sq ft barn has 2 stalls, office space, and additional space for storage.